I’ve been using the mbed platform for a while now after receiving one to develop the IoT Gateway project. 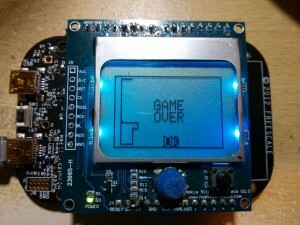 This was based on the NXP LPC1768 chip, the details can be found here. One of the downsides of this mbed was its price, even though the features are impressive for a microcontroller development board. Recently I came across the Freescale FRDM-KL25Z boards which are a similar size to the well known Arduino but for around £10 (prices may vary) they offer more power and features than the Arduino. They have a 48MHz cpu with 16K RAM and 128K Flash compared to the Arduino’s 16MHz cpu, 2K RAM and 32K Flash. The FRDM-KL25Z doesnt include any headers so these have to be purchased separately and soldered in yourself. For a comprehensive article on the FRDM-KL25Z, head on over to Tronixstuff. One of the interesting features is the Arduino compatible header layout, this enables a range of Arduino shields to be used with the FRDM-KL25Z providing the appropriate libraries are available. For shields to be compatible, they need to be 3.3V shields or use the 5V line to power 3.3V devices via an on-shield voltage regulator as the pins on the FRDM-KL25Z are only 3.3V tolerant. The SPI pins are in the correct place and the STDIO serial pins appear to be in the same place too. At present I have found existing mbed example code for the Nuelectronics Nokia 3310/5110 LCD and joystick shield and have now converted this to a library. Additional graphic drawing functions have been added, that I had in aprevious Arduino version, to make it more useful.The mbed code and libraries available at mbed.org/users/SomeRandomBloke/code/. Another library that I’ve ported is the Adafruit Arduino library for WS2801 RGB LED drivers. This can be used to display patterns on a number of RGB LEDs that are chained together. I have 2m of LED strips totaling 64 LEDs which can be quite impressive when all are being used at once! However they do need to be powered from an external source. More updates on the FRDM-KL25Z libraries and usage coming later.